Not to be confused with Chicken tikka masala. 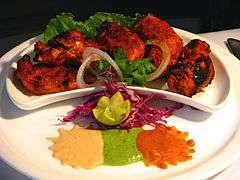 Chicken tikka or Murgh tikka [ˌmʊrɣ ˈʈɪkkaː]) is a chicken dish originating in South Asia where it remains popular in Bangladesh, India and Pakistan. 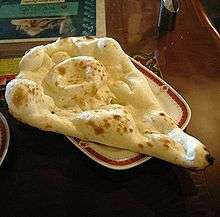 It is traditionally small pieces of boneless chicken baked using skewers in a clay oven called a tandoor after marinating in spices and yogurt—essentially a boneless version of tandoori chicken. The word tikka means "bits" or "pieces". 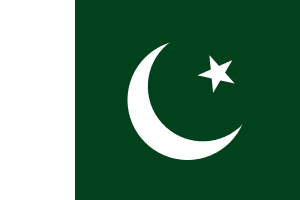 It is also a chicken dish served in Punjabi cuisine. The Punjabi version of the dish, however, is grilled over red-hot coals, and does not always contain boneless pieces. The pieces are brushed with ghee (clarified butter) at intervals to increase its flavour, while being continuously fanned. It is typically eaten with green coriander and tamarind chutney served with onion rings and lemon, or used in preparing a chicken tikka masala. A chicken tikka sizzler is a dish where chicken tikka is served on a heated plate with onions. The dish is also popular in Afghanistan, though the Afghanistan variant (like many other Persian, Turkish, and Arab dishes) is less spicy compared to the South Asian variants and uses beef and lamb in addition to chicken. ↑ Curry Club Tandoori and Tikka Dishes. London: Piatkus. 1993. ISBN 0-7499-1283-9. ↑ India: Food & Cooking. London: New Holland. 2007. ISBN 978-1-84537-619-2.